I have an existing MySQL instance (test), containing 2 databases and a few users each having different access privileges to each database. I now need to duplicate one of the databases (into production) and the users associated with it. I didn't find, however, a straightforward way to export and import users, from the command line (either inside or outside mysql). How do I export and import a user, from the command line? Then manually create user with the grants listed in the result of the 'show grants' command above. I prefer a safer, more automated way. Is there one? Above script will run in linux environment and output will be user_privileges_final.sql that you can import in new mysql server where you want to copy user privileges. I tackled this with a small C# program. There is code here to generate a script or apply the grants directly from source to destination. If porting from a Windows -> *nix environment you may have to consider case sensitivity issues. 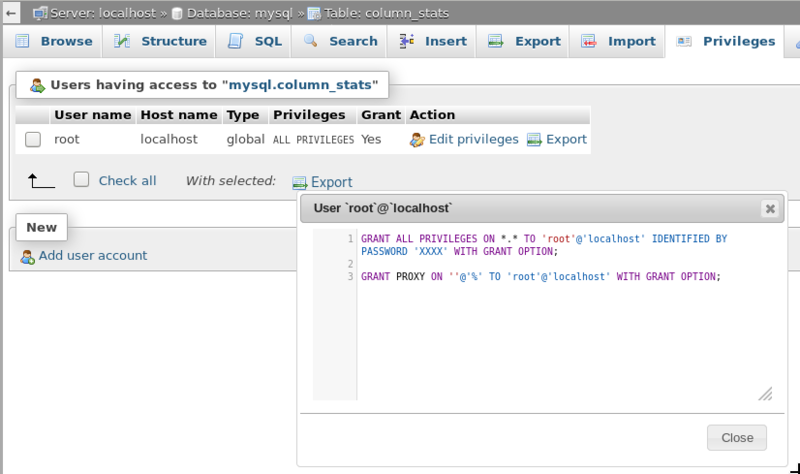 Login and Go to your database or a table where the user has access. All users with access are there. Select Export. And a little window with all the GRANTS are there ready to copy and paste. I had the same problem. The solution is that after the import of the backup you need to do a "flush privileges;". Then the privileges of the users will be active as in the original database. mysql -u root; then in mysql: "flush privileges;"
Upgrading XAMPP on Windows from very old version: Can I exclude the native tables without loosing important data?